Served: Chalice from a 750 ml bottle. 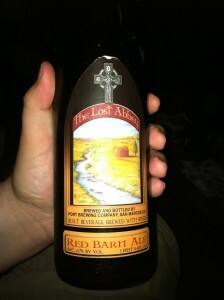 Purchased at Julio’s for $8.99/bottle. This review kicks off a series of ales I got Julio’s Annual Spring Beer Fest. Certainly the biggest tasting I’ve ever attended and, for a free event it’s pretty amazing. I’ll post on the event later in the week. The Lost Abbey brews under the same ownership umbrella as Port Brewing. Both are based in San Marcos, CA, and until recently I didn’t see many of their offerings in bottle shops here. Both have produced excellent ales, with Lost Abbey tending towards alternative interpretations of challenging European styles. After popping the (reluctant) cork, Red Barn pours a hazy, rusty orange. The crown piles up quickly and thickly; you could almost walk across the foam. The nose is fairly mild, yeasty, and with a little citrus and ginger. The taste is the equivalent of rye bread sandwich with granny smith apples. Tart fruity notes and a bitter bready funk. Ginger is present. And the hops, while not overpowering, have a solid kick.